From the border of Croatia, the road passes through relatively uninspiring inland farmland until it hits the coast. For about 25kms, I was thinking that all the hype about Croatia wasn’t living up to itself. I did however meet the third touring cyclist I have met so far on this journey. Sandra from France is cycling to Mt. Kailash in Tibet. Jolly nice to meet her. The uninspiring farmland continued. Then I hit the coast. 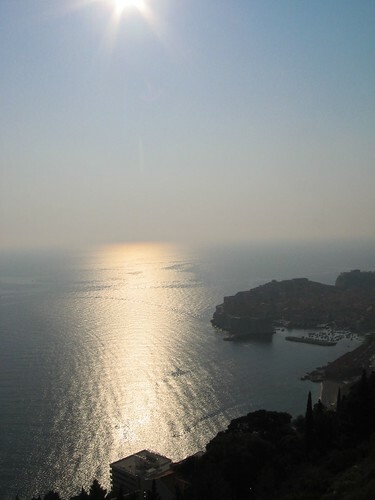 I almost cycled on past Dubrovnik, due to the fact that I would have to cycle down there, and up to get out. But just as well that I did go down for a look, as the town lives up to its fame as a beautiful old town. 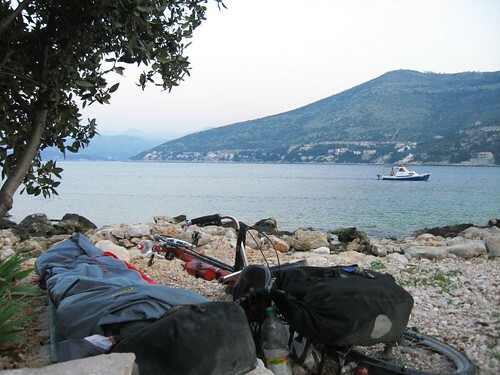 I cycled around through the narrow streets to the amusement of fellow tourists and locals alike, before making a beeline for the coast to find somewhere to sleep. I eventually settled on a quiet spot of stony beach. I found a large plank of discarded wood nearby, and used this as a ‘bunk’. 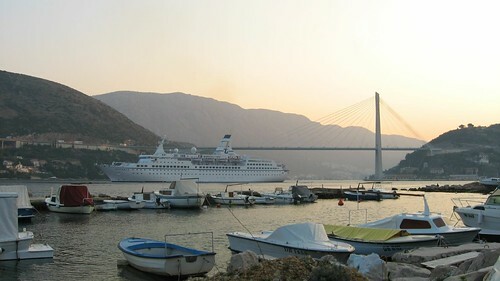 Quite nice, and slept till morning when I was woken by the sound of a large cruise ship entering the bay. Internet however is a different story. 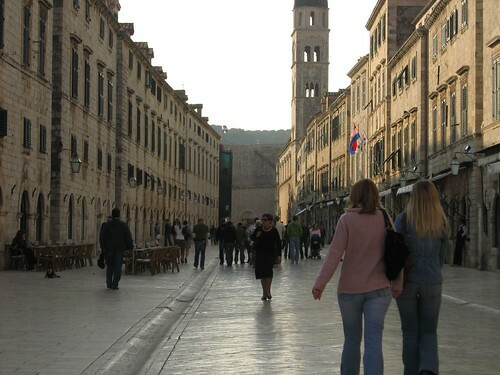 Perhaps is just coz I was in the tourist area, but the cheapest I could find in Dubrovnik was 3 Euro and hour. One place was charging 5 Euros! Rediculous. What about wireless network? Starting from Istanbul you might have found many open networks. What do you think about driving with a PDA? Maybe with a GPS bluetooth mouse and a foldable keyboard – so you could decrease the cost for internet while on the trip dramatically and write your essays in a more inspiring environment (on the beach in the evening …)? I'm just interested 'cause I don't know what way I'll navigate on my coming tour yet. Certainly looks a lovely place. Equal to NZ? We found most Internet places in Tasmania cost $5.00 an hour. Your cheap Chinese speedo has lasted well. Maybe another cheapie will get you to England. If you are heading up the Adriatic Coast, I still remember what a amazing scenery it was, Makarska, Split and even Zagreb. If you heading anywhere near Zagreb, don't miss Plitvicka Jezera, one of the most amazing lake and waterfall cascades in the whole world!!! You seem to be doing OK. Is there anything special in the way of food in Croatia? Daniel, I have certainly seen more wireless access spots as I travel west. Especially in Istanbul there were plenty around. However, in the end I don't really mind about the cost of internet. It gives me an opportunity to sit down inside for a day and relax. Listen to music on Youtube as I type. I did have a PDA, but didn't end up using it as much as I had expected. The most I had used it for was for typing up the Japanese versions of the updates. I have been very slack on the Japanese side of the site of late though. It is a lot of work doing everything twice. I used the PDA more when I was staying at cheap accommodation in Asia. The battery only lasted about 3 posts worth of typing before I had to recharge it (I should have taken the DC power cord). Now, when I don't stay at accommodation, it is tough to recharge stuff. Rich, cheers for the advice on Plitvicka Jezera. I had spied that lake on my map, and was contemplating visiting it. If the weather holds, I'll take a look. Any more adventures on the boil for you?